Check out Page Turner Winner Leola Ogle’s interview here, and Runner-Up Beth Meuhlhausen’s here. And now, it’s time to introduce you to our other Page Turner runner-up, the delightful Dannie Hawley. Read on to learn more about this amazing woman, her passions, her struggles, and her book! JOANNE: When do you first remember developing a passion/love for writing? DANNIE: Hmm, this is a rather embarrassing question, considering this post is being read by writers who have serious passions for writing. I wish I could jump up, with that radiant sparkle in my eyes, and say, “Age three and a half, when I wrote my first scribbles on paper and called it ‘Mr. Shorty Ate My Turtle.’” I don’t think I have a passion for writing yet. I can, truthfully, tell you that, until the age of fifteen, I had no idea my writing was any different than any other kid in the school. My sophomore English teacher asked me to write an article for a high school writing contest the National Scholastic folks were running. I was shocked that no one else in the class was asked to do it. I think that the encouragement of my English teacher made me realize that I found writing easier than the other kids, because God had given me some talent in that area. With that said, what I can admit to is a real passion for story-telling. Not just any story, but something that the Lord has done in my life or in the life of another…well, I’ve just got to tell that story with all the details and expressions. Since writing the story down will allow more people to hear the wonderful stories of God in the lives of His children, I love to write them. Hmmm? So, maybe I do have a passion for writing true stories then, after all. JOANNE: You’re so cute – and funny. Yeah – you have a passion for writing. 🙂 Is writing a hobby or potential career for you? JOANNE: I think you’re well on your way to knowing how to “do it right.” Share a bit about Grace for the Night Hours. Where did you get the idea for it? What’s it about? How far along in it are you? DANNIE: Since I had been working on another book for about eight months when I decided to throw my hat in the Page Turner ring, I am only as far as I needed to be in order to enter the contest. Grace for the Night Hours is the story of my blindness…how it happened, and what it was like to live and work deep in the African jungle when the total darkness enveloped me. Except for a few months in the middle of the six years that followed the event, I continued my work as the medical director of our jungle clinic. The title comes from the early realization that, because the daytime was so full of work-related activities, I didn’t even think about the tragic loss of my eyesight; I just worked around it, as best I could. In the night hours, however, there was nothing to distract me from the loss; therefore, I felt I needed God’s grace for the night hours more than at any other time. Now, before my fellow-FW writers groan and vow not to read this book – I mean, don’t we have enough tragedy in the world, without bringing more sad stories into our reading life? – let me assure you, I counted this unexpected development in my life a challenge and there were some pretty hilarious moments about which to write. Hopefully, you’ll get a chance to read it for yourself one day. JOANNE: I sure hope I can! Your story sounds fascinating. You have served as a missionary for many years in several different places. Tell us a bit about it. DANNIE: Though I did a project for about a year with the Northern Cheyenne Indians in 1973/4 and a summer working with missionaries in Puerto Rico in 1980, my uninterrupted missionary career began in 1984. I served aboard the MV Anastasis during the time it was a part of Youth With a Mission (YWAM). When a call came to send someone from the medical department to help in the camps for victims of that terrible famine in Ethiopia, I had the privilege of working in that rugged camp. 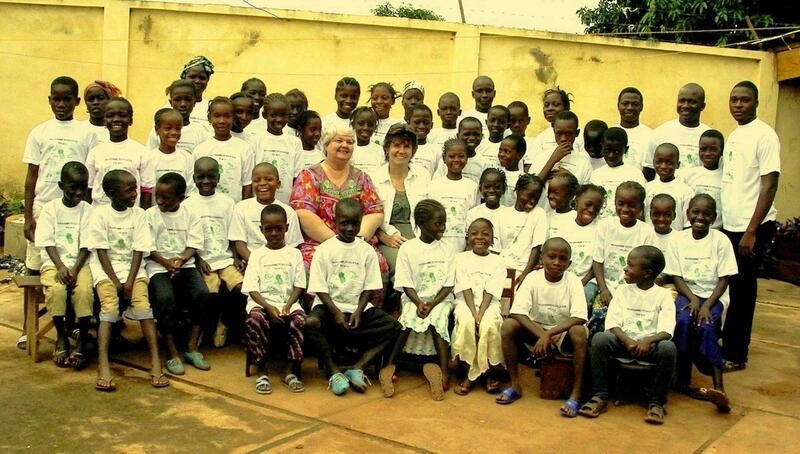 Though I have also served for short-term projects in Mexico, Belize, Guatemala, Burkina Faso, Mali, and the Ivory Coast, the Republic of Guinea in West Africa has been my home since 1991. I was also privileged to be on a two-week, commando-style mission to help Christians in a village in India, following the tsunami of 2004. Lest you think we may not be called upon to serve while on home assignment furlough, the earthquake of 1989 let me experience long hours on a relief team right in my home country for a few months. Do you see why I just love story-telling? My life has provided so much terrific material from which to draw! JOANNE: Terrific material indeed! How did you find FaithWriters and what made you stick around? DANNIE: At last, an easy-to-answer question. The last few days in January found me with just a bit of free time on my hands. Since I was in an African country that actually had a fast internet connection that week, I decided to google “Christian Writing Groups.” Honestly, I had no idea such a thing even existed, to show you how far behind the program I was at the start of this year. FaithWriters was the first group listed. I read about it, tossed the idea around, and decided that Christmas money, still burning a hole in my pocket, should be used to give FW a try. I’m so glad I did! What made me stay? The people. I had never before had any friends who liked to write. It was wonderful to have that connection with other Christians. In such a short time, I learned so much from those interested in helping me improve my writing. It is a lot like being back in that high school English class, with a teacher who really did care that I did my best work. 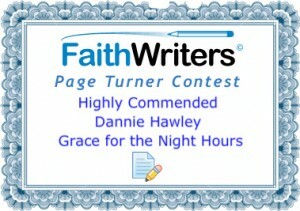 JOANNE: I definitely second your love for the wonderful people of FaithWriters. What kinds of books or genres to you prefer to read and/or write? DANNIE: I read both fiction and nonfiction. I love to learn new things and also to read autobiographies or memoirs from interesting people. I like mysteries and medical thrillers the most, but I do enjoy reading anything along the inspirational line, fiction or nonfiction. As to what I like to write, I would have to say inspirational. As I said, I just love to tell a good story of what God has done. If I can weave some Bible story in the telling, all the better. JOANNE: Tell us about your family. DANNIE: My mother is ninety years old and still very much in my life. God has never made a better PR person this side of heaven. I’m the middle of three sisters. Neither are writers, but both are very supportive of my efforts. As to the other family God has given me, I currently have forty-eight children between the ages of five and fifteen, about an even number of boys to girls. I used to have a few more, but they have gone to live with extended family members far from our home city. Our family photo from last summer is here, in case you might think this is a bit of story-telling fiction. JOANNE: What a great bunch of “children” you have. What are your other passions besides writing? DANNIE: Reading, and listening to Christian music, though preparing dinner with a new recipe ranks right up there, too. JOANNE: I’m with ya on all but the last one (LOL) Do you make New Year’s Resolutions? If so, what do you hope to accomplish in 2012? Years ago, when I was hearing the catch phrase “God wants to do something new” everywhere I went, I asked the Lord if that was for me, too. Then, I realized how many new things are still to be finished so decided His word for me was more along the lines of finish up some of those new things already begun. So, I never make New Year’s resolutions. Instead, I try hard to finish something up. For 2013, I am determined to finish Grace for the Night Hours. JOANNE: I’ll definitely be praying that you do, Dannie. Is there anything else you’d like to add? 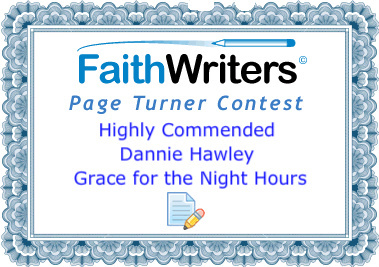 DANNIE: To me, FaithWriters is a family of unforgettable people who care about writers: their skill, their pain, and their success. Though writers, as a rule, are pretty competitive folks, FW is as interested in the success of the Beginner as that of the seasoned Master Writer. Sometimes that caring is in the form of constructive criticism, so I not only get a chance to improve my writing, but also to practice humility. I believe that God is pleased with both opportunities for me. A gigantic “thank you” to all of you dear FW friends! JOANNE: And thank YOU, Dannie, for all you’ve done through your missionary work and for blessing us with your writing, and your interview today. Hope you’ve enjoyed these three interviews. The 2013 Page Turner opens on January 1, 2013 – and this year, the topic is fiction. Watch for details soon, and start getting that manuscript ready! 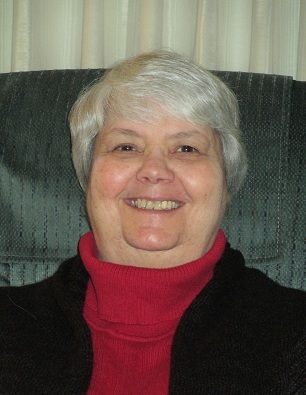 Meet Fiction Page Turner Runner Up Sylvia Young! Meet Page Turner Runner-Up Beth Muehlhausen! Meet Nonfiction Page Turner Runner-Up Sherri Stone! Thanks, Joanne. Fantastic interview. And no groans here, Dannie, I can’t wait to read your book. Congratulations!